07:41 Good morning and welcome to AUTOSPORT Live for coverage of Friday's free practice action to kick off the Hungarian Grand Prix weekend. 07:45 The first Formula 1 session of the weekend kicks off in around 15 minutes, at what is traditionally one of the track surfaces that starts the weekend in pretty dirty condition. 07:46 The fact that all the drivers get an extra set of tyres for use only in the first 30 minutes of the session should mean that we see everyone contributing to the 'clean-up' operation in the early stages, but things could go quiet after that. 07:58 One thing to look out for today is how the drivers get on with their cars on this second weekend following the removal of the FRIC suspension systems. 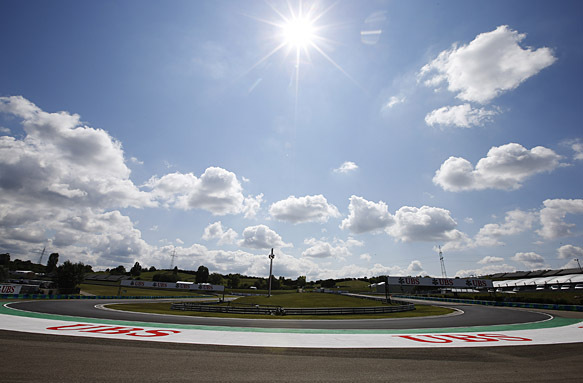 It certainly made free practice at Hockenheim last weekend pretty lively, and several drivers told the media yesterday that they expect the twisty Hungaroring circuit to highlight the differences more than was the case in Germany. 07:59 Track temperature is already 39C, with an ambient of 23C. The natural bowl of the Hungaroring always makes it feel hotter somehow. 08:00 Sergio Perez is first out with the installation laps, followed by Valtteri Bottas and Jean-Eric Vergne. 08:01 Hukenberg joins in too, along with Kvyat, Bianchi, Magnussen, Gutierrez, Kobayashi, Grosjean, Button, Alonso, Ericsson, Chilton and Maldonado. 08:02 Raikkonen joins the fun too, so that's just the Red Bulls, the Mercs and Massa's Williams to go. 08:02 BEN ANDERSON: "Williams will trial a high downforce rear wing today. The team had trouble with this kind of wing earlier in the season, but will hope greater understanding of the car now will improve results. "Felipe Massa expects to get less benefit than team-mate Valtteri Bottas, because he has to run the same floor he damaged slightly in his first-lap barrel rolling incident with Kevin Magnussen in last Sunday's German Grand Prix." 08:03 Our Grand Prix Editor EDD STRAW is trackside for this session. He's started by heading out to Turn 2, where he has spotted aero paint on the engine cover of Alonso's Ferrari. 08:03 Vettel joins in, as the pitlane starts to fill with those who've completed their install lap. Magnussen is going for a second. 08:03 Ricciardo is now out there now. Button and Alonso have stayed out for a second lap too. 08:04 Drama in the pits as Chilton's Marussia catches fire before he can get to the team's garage. He stops the car and the marshals put the flames out quickly. 08:05 Replays show the car produced a huge plume of smoke as Chilton slowed at the pit entry, before quickly turning to flames. Marussia mechanics are now pushing the car back to the team's end of the pits after Chilton stopped it in the 'slow lane' about halfway along. 08:06 Rosberg and Hamilton start their installation laps. 08:07 EDD STRAW at trackside: "Alonso is the first driver to come through quickly. He takes a big bite of inside kerb at T3, which unsettles the car onto the following straight. Raikkonen, by contrast, stays off that kerb." 08:08 Rosberg isn't hanging around on his installation lap, setting two purple sectors. Shows his intent. 08:08 Rosberg told "cancel brake warming magic for this lap. Brake temperatures are very good" on the radio. 08:09 He goes for a second one, and is the first to record a time: 1m32.027s. 08:10 Hamilton tops that with a 1m31.426s. Mercedes straight into their run plan today. 08:11 Rosberg bites back: a 1m28.754s as the track cleaning process continues. 08:11 Hamilton's new best is 1m29.703s. 08:13 The back of the Mercedes steps out on Hamilton at the penultimate corner, and that twitch is enough to send him through one of the many asphalt run-off areas here. Rosberg has also had a brief run off track, he ran wide at the previous corner. 08:13 Rosberg does a 1m30.142s on that lap, but Hamilton tops his best effort with a 1m28.030s. 08:14 EDD STRAW reports from trackside that Hamilton has had a moment at Turn 2 as well: "Lewis carried too much speed into the corner and had a big understeer moment. He had to get out of the throttle, then had a big rear wobble as he got back on the power." 08:14 Hamilton is on top through all three sectors, and set his fastest time on his fifth lap. 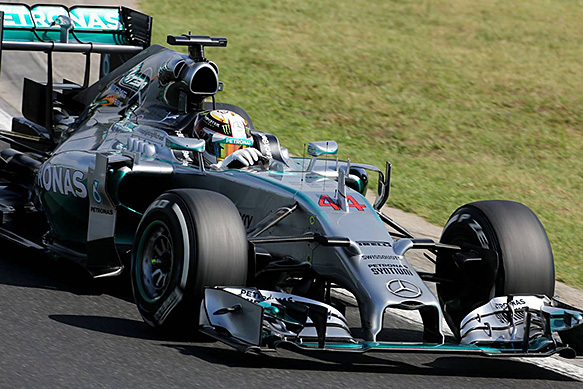 08:14 A new fastest lap from Hamilton, a 1m27.604s. 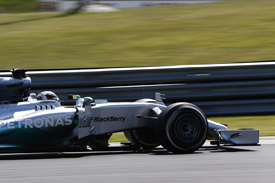 08:15 Rosberg grabs the top spot back, a 1m27.320s. This is quite some battle early on in the weekend! 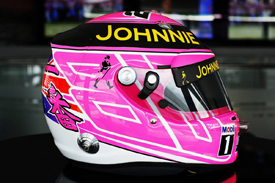 08:15 @McLarenF1: "The #PinkforPapa helmet returns this weekend - Hungary is an emotional and significant place for @JensonButton"
08:16 Marussia confirms Chilton's fire was caused by an oil leak: "So that dramatic looking moment was caused by some oil leaking onto the exhaust of Max's car. Just looking at how." 08:16 Hulkenberg, Bianchi, Kobayashi and Maldonado join the track, to spoil Mercedes' exclusive testing. Remember, the tyres they're using right now have to be given back in less than 15 minutes. 08:18 Rosberg and Hamilton are both on their ninth lap now, and although Rosberg set the fastest middle sector it seems the tyres have passed their best, even though the track is cleaning. 08:18 Hulkenberg goes third fastest on 1m31.449s. 08:18 Kobayashi and Bianchi also record times, as does Perez. 08:18 In other crash helmet design news, Rosberg has kept his 'German' design from last weekend that celebrates his country's success in the World Cup. 08:19 Rosberg pits after his nine-lap run. 08:20 Vettel goes third fastest on 1m30.310, but is eclipsed by his team-mate (story of his year?) by Ricciardo on 1m28.534s. 08:20 Kobayashi is wrestling with the Caterham. He's had several twitchy moments, mostly in the final sector of the lap. He's not alone - Gutierrez has just copied Hamilton's minor off at the penultimate corner, and Hamilton has been off again, this time at the Turn 4 left-hander. 08:21 We're expecting great things from Red Bull at this race, as the Hungaroring should play to its strengths and negate some of its grunt deficit. 08:22 Hamilton gets into double figures now in terms of laps completed. Alonso is up to fourth now, on 1m28.874s. 08:22 Kvyat says he's "struggling with the rears" - that didn't take long. 08:22 Raikkonen goes fifth fastest for Ferrari, 1.6s off the pace of Rosberg. 08:24 Ricciardo improves his third-fastest time by half a second. He is now 0.691s off Rosberg's top time with 1m28.011s. 08:24 Hulkenberg is also struggling with his rear tyres: "I need a cool down [lap] for the rears, the rears are overheating." 08:25 Recent form man Bottas improves his time but is only ninth fastest so far, almost 2s off the pace. 08:25 The Mercs and Marussias are the only cars in the pits right now. 08:26 "Laptime doesn't work, I don't get anything on the dash," says Vettel, so his engineer lets him know his pace. 08:26 Button pops up in P5 with a 1m28.258s. He always goes well here. 08:27 The early pecking order is Mercedes, Red Bull, Ferrari, McLaren and Toro Rosso. 08:27 Maldonado's Lotus is currently outpacing the Williams duo, which is a surprise. 08:28 Button goes third fastest on a 1m27.904s. 08:28 Raikkonen goes P2 with a 1m27.463s. 08:28 EDD STRAW from trackside: "The inside of T3 allows you to get pretty close to the apex on the inside. While not in itself particularly challenging as a corner, carrying speed through here is essential for the straight that follows. "It's noticeable that both Ferraris have a little bit of rear instability as they exit over the rumble strip. Ricciardo seems to struggle a bit on turn-in for the quick right-hander after exiting Turn 2 slightly wider than some." 08:29 Raikkonen is just 0.143s off Rosberg's fastest time. How much of that was the track cleaning, or is the Ferrari genuinely in the hunt pace-wise? 08:29 Cars now dive for the pits as they have to give these tyres back to Pirelli. 08:30 Sutil makes the pitlane with 7s on the clock. 08:30 Rosberg rejoins the track, as everyone else has pitted. Mercedes seems mighty keen on some clean-air running today. 08:31 Vettel and Alonso return to the pits with several boots of oversteer-inducing throttle. That'll be them using up those tyres that had to be given up after the first 30 minutes here. Elsewhere, Grosjean is complaining that he is not being given enough laps to get any meaningful work done. 08:32 The current top-10 order is Rosberg, Raikkonen, Hamilton, Button, Ricciardo, Alonso, Vergne, Vettel, Magnussen and Maldonado. 08:32 @CaterhamF1: Both cars now back in the garage and the general consensus is "there is almost no grip at all..."
* Rosberg is the fastest in the early laps with a time of 1m27.320s. * The championship leader is ahead of Raikkonen, Hamilton and Button. * Chilton is out of a his race suit after his Marussia caught fire following an oil leak. 08:33 From P11 down it's Bottas, Massa, Hulkenberg, Perez, Kvyat, Gutierrez, Sutil, the troubled Grosjean, Kobayashi, Bianchi, Ericsson and Chilton. 08:34 Rosberg continues to circulate on a fresh set of mediums. He's straight into the purple sector times on this lap. 08:34 EDD STRAW: "The Force Indias are shifting up a couple of gears for T3, presumably helping to keep the rear stable as well as potentially keeping fuel use down a bit. "At Williams, Massa's car seems to be stiffer than Bottas's. Either that or he is finding the bumps that others are missing." 08:34 That fastest first sector time was previously owned by Raikkonen. Rosberg is purple in sector two as well. 08:35 Rosberg sets a new fastest lap, 1m26.114s. 08:35 Rosberg is the only man on track, and EDD STRAW says he's having to be careful on the throttle exiting T2 after having "a wobble" there on a previous lap. The world championship leader is told to "push again" on this lap. 08:35 ...Rosberg pushes too hard, cuts the chicane, and that lap is gone. 08:35 That was a 1.206s gain over his previous best, showing just how mach the track evolved after that first run. 08:37 For those of you who want to monitor the sector times this weekend, Rosberg's lap is 30.2s (S1); 31.4s (S2); 24.3s (S3). 08:38 Rosberg is on a cool-down lap right now, expect him to push again shortly. 08:39 Rosberg improves his time to a 1m25.997s. 08:40 He's lowered his middle sector by three-tenths, and is on an even quicker lap now. 08:41 @Marussia_F1Team: We have changed Max's gearbox, we're putting the car back together and we're hoping to get out towards the end of the session. 08:41 Rosberg's fourth lap on these tyres tails off after a fastest first sector. So we might see some four-lap runs in Q1 on the medium tyre for the teams who think they can make it through. 08:43 Hamilton joins the track with a practice start. 08:43 Kobayashi and Raikkonen are the only other cars on track. 08:44 Hamilton is in Kobayashi's way. A rare thing to write. 08:44 Grosjean is also on track as we pass the halfway point. 08:45 As you'd expect, Hamilton is improving on his sector times straight away. 08:45 Two green sectors on this lap so far. 08:46 He improves to P2, deposing Raikkonen, with a 1m26.239s. 08:46 A Mercedes comparison from EDD STRAW at Turns 2/3: "Hamilton has been taking a slightly wider line early in T2, which allows him to be tighter than Rosberg at the exit. "However, he has switched to a wider exit on this latest run." 08:46 Hamilton's time is 0.242s slower than Rosberg's benchmark. 08:47 Kobayashi cuts the chicane, but that wasn't a moment of understeer or front locking. The Caterham had a nasty rear-end step-out as he hit the brakes, forcing him to run straight on. 08:47 A purple first sector from Raikkonen now, he is loving that part of the track. 08:48 More Caterham dramas: Ericsson has a quick spin at the Turn 12 right-hander. That one was very much driver error, he wandered onto the grass with his outside wheels just before turning in. 08:48 Raikkonen improves to 1m26.421s, despite a lock-up. He stays third. 08:49 Raikkonen has a lock-up at the penultimate corner, but unlike others he keeps the car on track and only misses the the apex by a small amount. 08:49 Raikkonen is 0.424s off Rosberg's pace. 08:50 Hamilton sets a new benchmark, a 1m25.814s. 08:50 EDD STRAW has spotted minor offs for Maldonado and Vettel at Turn 2. "It's quite bumpy here when you are on the outside there at mid-corner and exit." He adds that Raikkonen is very smooth through that section, and "potentially looks stronger than Alonso". 08:51 Despite the high track temperatures, it seems that the medium tyre is quicker after a cool-down lap following the initial run. 08:51 Vettel improves to fourth on a 1m27.457s. 08:51 Grosjean cuts a frustrated figure on track at almost every GP Friday, and it's no different here. He locks up into Turn 12, and after running wide past the apex he then gets a snap of oversteer for good measure. 08:52 Vettel is 1.643s slower than Hamilton. That's quite some gap. 08:52 Hamilton set a faster first sector on that second go, but then his lap tailed off. Just like Rosberg did. 08:53 Hamilton pits. He and Rosberg have run near-identical run plans today, both have completed 16 laps. 08:54 EDD STRAW: "Having watched both Mercedes drivers early in their runs, I would say Rosberg is looking the more comfortable. He's carrying good speed into and through Turn 2 whereas Hamilton occasionally has the rear drifting a bit too much in the early phase of the corner. "As for the Red Bulls, Vettel is very committed on the brakes. I heard a slight lock-up on that lap but there was no tyre smoke and he still got the nose in. Ricciardo is a bit calmer on entry but able to get the power on earlier in general." 08:54 Vettel says "the car is the same as before - low grip everywhere, especially sector 2, and arriving at sector 3". 08:55 Magnussen improves to P5, on 1m27.847s. He's immediately demoted by Ricciardo on 1m27.782s. 08:55 Grosjean isn't the only Lotus driver struggling this morning - Maldonado's car wanders wide in Turn 11 and he takes a trip through the asphalt run-off. 08:56 Williams is miles off the pace so far, over 3s off the Mercs. 08:56 Raikkonen pits. This is his best FP1 performance in ages. Alonso jumps up to fourth, but is four tenths in arrears of the Finn. 08:57 Alonso is just over a second off Hamilton's best time. 08:57 For the second Friday in succession EDD STRAW is impressed by Raikkonen's ability to deal with front lock-ups. He says it's easy to do at Turn 2 as the track drops away on the inside. He adds that Alonso is a bit too hot on the way into Turn 2, and while he tries to make it work with a wider line, the car starts "hopping" on the bumps as he tries to feed the power in. 09:00 Toro Rosso has shown promising form in this session, both cars are in the top 10. Vergne is seventh; Kvyat is 10th. 09:01 More trouble for Alonso at Turn 2 - this time he goes off track as a result. EDD STRAW tells us that Bianchi also got the entry to the same corner wrong, but he took an interesting approach to cut back and avoid the bumps that we've been talking about. Elsewhere, Button runs wide at Turn 12. 09:01 "I just don't have rear grip, not at all, especially in low-speed corners," says Button after a little twitch mid-corner caused that moment. 09:02 Alonso was on a better lap there, but a poor final sector scuppered his chances of improving. 09:02 Bottas gets to within 2.7s of the Mercs, but is still down in 13th behind both Force Indias. 09:04 Rosberg rejoins the track. Will he attempt to have a crack at Hamilton's fastest time? 09:04 Rosberg on the radio: "I had a very harsh first-to-second upshift on the [practice] start there, can you have a look at it?" 09:04 Bottas improves to 11th but Massa trumps him by a couple of hundredths. The Williams duo move ahead of the Force Indias. 09:05 Perez joins the club of drivers struggling with oversteer during this session. He's had moments at the first and last corners in the last couple of minutes. 09:06 Mercedes reveals on Twitter that sector two is where Hamilton has the edge on Rosberg at the moment. 09:07 There's a good battle for supremacy in minnow-land. Caterham's Kobayashi heads Marussia's Bianchi by 0.047s. 09:08 Massa goes 10th on 1m27.960s. Gutierrez leaps up to 11th with a 1m28.140s. 09:08 Paceman Hamilton rejoins the track. 09:08 @Marussia_F1Team: "Is that a fire-up we hear? It certainly is. Well done boys for a rapid turnaround on Max's car. Floor going on next." For those of you who weren't with us early in the session, Chilton's car came to a fiery stop in the pits, and his team has been flat out trying to get him some track time. 09:09 Team pecking order so far is Mercedes, Ferrari, Red Bull, McLaren, Toro Rosso, Williams, Sauber, Force India, Lotus, Caterham and Marussia. 09:11 Another wobble for Grosjean at Turn 12. Not sure he can blame that one on the car - he was driving one-handed in the middle of the corner because he was changing some settings on the steering wheel! 09:12 Niki Lauda - a former world championship-winner for Ferrari but now of Mercedes seniority - is spotted in the back of the Ferrari garage talking to its team boss Marco Mattiacci. 09:14 As the tyres get older in this session, EDD STRAW is "seeing more lock ups and squirmy rear-ends". He reports that Rosberg had a bit lock-up which started as soon as he hit the brake pedal, which he describes as "unusually early". 09:15 Hamilton is on track running aero paint underneath the middle section of the Mercedes' nose, running back along the car to the front of the floor. 09:16 Grosjean is told on the radio: "We've got a problem with the water system - we're not going out." 09:18 Hamilton is told: "It's the middle sector we need to find time, around two tenths." Meanwhile Rosberg is told to carry more speed through Turn 4, using up more track on the exit. 09:19 Rosberg had a very slow final sector on that lap of his run. 09:24 Kobayashi has edged away from Bianchi in the battle for 19th. But his Caterham is almost 2s slower than the next-fastest car of Sutil. 09:24 Chilton is in the Marussia and ready to go, but the team has had a couple of failed attempts at getting him out of the garage. 09:25 Kobayashi improves again, he's now six tenths clear of Bianchi. Ericsson also moves ahead of Bianchi. 09:25 Success this time - Chilton heads out with four minutes to go. 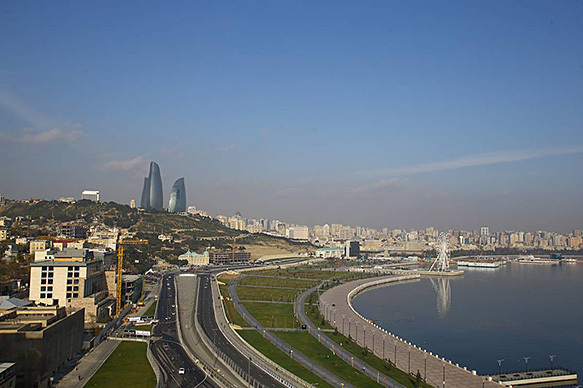 09:26 Azerbaijan has announced that it has signed a contract to host a grand prix in the capital Baku in 2016. 09:28 Maldonado is P13 in this session, a few tenths clear of Grosjean, who has suffered quite a troubled practice so far. 09:29 Huge lock-up for Rosberg as he approaches the pit speed limit line. He eventually smoked both front wheels. And we get a replay of a spin for Sutil in the Sauber. 09:31 Chilton finally records a laptime, a 1m31.004s. That's quicker than Bianchi at the first time of asking. Not bad. 09:32 With the session over, the cars are returning to the pits and being pushed back into the garages. Rosberg had the most productive morning with 31 laps under his belt. 09:34 In the sectors, the quickest times are Hamilton (S1 - 30.1s); Rosberg (S2 - 31.1s); Hamilton (S3 - 24.0s). 09:35 Here's a story that went up on AUTOSPORT.com during that session - which team boss has described F1 as a 'lame duck' following the disappointing attendance at the German GP last week? 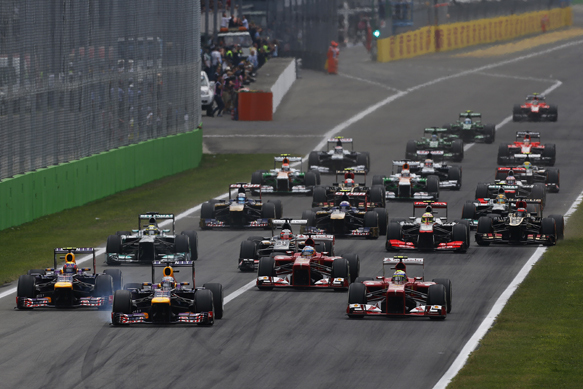 Click here to read the latest on an interesting debate about F1's popularity. 09:36 Hamilton ended the session 0.183s quicker than Rosberg, with Raikkonen 0.6s off the pace, with Alonso another four tenths slower than his Ferrari team-mate. Then it's a Red Bull v McLaren v Toro Rosso mish-mash. 09:45 AUTOSPORT Live will be back with regular updates in a couple of hours when we start getting ready for FP2. We'll go quiet until then, but we will keep you updated with any breaking news from Hungary during the gap. 10:01 If you're looking for something to do in the break between free practice sessions, don't forget to update your entry in the Castrol EDGE Grand Prix Predictor for this weekend - where a Sony PS4 is up for grabs. 10:12 Our Group F1 Editor JONATHAN NOBLE has just returned from the paddock with some updates on the future of the Italian GP. We'll have more on that soon. 10:14 Remember, Bernie Ecclestone caused a stir a few weeks ago when he claimed "It's bye-bye after 2016" for the Italian GP - one of the staples of the calendar throughout F1's history. You'd have to think that losing a venue as special as Monza from the calendar would do little to improve F1's relationship with its fans. 10:23 If you want to join the debate on the F1 calendar - whether it's the potential loss of a race like Italy, or new additions in Mexico and Azerbaijan - head over to the AUTOSPORT Facebook page to have your say. 11:03 Here's more on the future of the Italian Grand Prix: Former F1 driver Ivan Capelli has joined Monza's efforts to save the race, and he wants ex-Ferrari team boss Stefano Domenicali involved as well. 11:41 As the F1 teams continue their preparations for FP2, which starts at the top of the hour, we'll take a moment to note that McLaren led Williams in GP2 free practice earlier. For those who don't follow the F1 feeder series, that means McLaren protege Stoffel Vandoorne led the way from Williams test driver Felipe Nasr. You can read our full report by clicking here. 11:48 This is normally a session that gives us our first real clues regarding the form for the weekend. The teams will try the softer-compound tyre out, which will give us the headline times, and they'll be focusing on some long-run work later in the session too. Later today, EDD STRAW and GARY ANDERSON will analyse what we've seen from today's running for AUTOSPORT.com. Nico Rosberg: "I would have got more pleasure out of the [German GP] victory if it would have been a gloves-off battle." Lewis Hamilton: "I really feel like the last 18 months with the team have been the most enjoyable of my life." 11:57 Weather update: air temp 26C; track temp 54C. 12:00 And the first car out on track is... Nobody yet. 12:01 Our first taker is Chilton. 12:02 He lost a lot of time in FP1 following a gearbox fire, and is keen to make up for it. 12:02 Ericsson joins him. 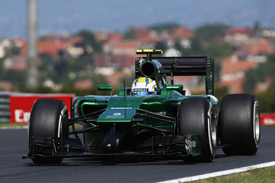 Caterham had the edge over Marussia in the first session. 12:03 Plenty of other drivers are either in their cars or getting ready at the moment, so it shouldn't be long until more cars make it out on track. 12:03 Kobayashi also enters the fray in the second Caterham. He was the quickest of the two minnow teams earlier. 12:03 Chilton goes straight into a second lap. 12:04 ...As does Ericsson. Hulkenberg now on track too, and Maldonado. 12:05 Chilton clocks the first time of the session, a 1m34.426s. Bianchi joins the track, as does Gutierrez and Magnussen. 12:05 Ericsson now goes P1 on 1m34.239s. 12:05 The two Toro Rossos are also now on track. 12:06 Raikkonen is the first of the big hitters from the first session to join the action. 12:06 Repeating a trick we saw this morning from the Caterhams, Ericsson has a twitch under braking for Turn 2. He manages to catch it without having to run off track. 12:06 Hulkenberg sets the new bar, a 1m28.781s. 12:07 Grosjean and Perez now on track. 12:07 Maldonado sets a new best time, a 1m28.751s, to just eclipse Hulkenberg. 12:08 Another Caterham going sideways - this time it's Kobayashi getting out of shape in the middle of the quick Turn 4 left-hander. Magnussen's McLaren has a bigger issue, he bounces through the gravel at the chicane. 12:08 Gutierrez sets the fastest first sector time, but the rest of his lap is disappointing. 12:09 Raikkonen the car to watch right now, fastest first sector of the session. 12:09 BEN ANDERSON is trackside for us in this session and he reports that Chilton's car is "tail-happy" coming out of the penultimate corner. Right on cue, Chilton is less-than happy on the radio: "The car is now horrible, horrible to drive." 12:09 Bianchi goes fifth quickest. 12:10 Raikkonen backed off in the middle sector there. 12:10 Maldonado has a quick spin at Turn 9. 12:10 Hulkenberg is now quickest on 1m28.336s. 12:10 The Lotus driver lost it on the way into the corner. That's not normally a place we see cars spinning. 12:11 Raikkonen gets message on his radio regarding "a problem with the rear wing". 12:11 Alonso sets the outright fastest first and second sectors. 12:12 Alonso finishes his lap with the fastest time yet, a 1m27.199s. 12:13 Alonso's time is three tenths slower than what he managed this morning. Button goes second fastest on 1m28.136s. 12:13 Kvyat goes fourth fastest on 1m28.447s. "Grosjean is tentative on the way in but carries decent mid-corner speed and runs wide on the exit. "Sutil is deeper on the brakes, slower at the apex, but that makes him straighter for the exit. "Hulkenberg carries great momentum into the corner and trusts the car to stick. Perez is a bit more tentative than his team-mate on the entry but that doesn't seem to allow him to get any earlier on the throttle. "The Ferrari looks a bit lazy - Alonso is always waiting for it to catch up with him." 12:13 EDD STRAW: "Each driver will use two sets of tyres in this session. Everyone is on the medium-compound Pirellis right now but will switch onto the softs for a quick lap and then get into some serious long-run work." 12:13 Both Mercs are now on track. 12:14 Vergne has a moment at the final corner. The rear stepped out on him and he had to scramble to prevent it from swapping ends on him. He's just run wide at the fast Turn 11 right-hander as well. 12:14 Vettel goes second fastest on 1m27.740s. 12:15 Rosberg's first lap is a tardy 1m32.284s. A very gentle opening lap. 12:15 Rosberg now sets the fastest first sector. Wonder if that first slow lap was intentional or traffic or a mistake? 12:16 Hamilton's first lap is also a slow 1m30.178s. 12:16 Rosberg had to negotiate a cruising Vettel in the middle sector. 12:16 Rosberg goes fastest, a 1m27.112s. 12:17 Button improves to fourth on a 1m27.943s. 12:17 Hamilton completes another very slow lap. 12:17 Bottas goes third, a 1m27.341s. 12:17 BEN ANDERSON reports that Perez is experimenting with different lines in the penultimate corner. He's tried to mimmick team-mate Hulkenberg's "more committed" approach, but has since reverted to his original "tidier" line. Vettel's had a "bizarre correction" at the same corner, with our man observing that he appeared to turn in too early. 12:17 Vettel sets the pace on a 1m26.949s. 12:18 That's a faster lap than he managed this morning. Progress for Red Bull? 12:18 Vettel had a big oversteer as he ran out onto the exit kerb of Turn 11. No lack of commitment, that's for sure. 12:18 Hamilton finally sets a representative time after two apparent warm-up laps. It's a 1m26.225s. 12:19 BEN ANDERSON says Vettel's last run past him at the penultimate corner was "the best-looking" he's seen so far in this session. "Committed, no lock-ups and a beautiful smooth arc." 12:19 Rosberg goes P2 on 1m26.696s. 12:20 @WilliamsRacing: "#FP1 was all about aero - evaluating all our performance updates which so far look good. #FP2's focus is on understanding the tyres as well as some final aero tests"
12:20 The gaps are +0.471s to Rosberg; +0.724s to Vettel; 0.974s to Alonso. Bottas is over a second off. 12:20 Hamilton sets a new fastest first sector. 12:21 Vettel is still pushing out there - running wide over the exit kerb of Turn 5 and then getting out of shape and having to straight-line the chicane that follows. 12:21 Hamilton lowers his fastest time to 1m26.161s. 12:22 BEN ANDERSON has been able to compare the Red Bull team-mates at the penultimate corner. After being full of praise for Vettel, while Ricciardo (running aero paint around the bottom of the rear wing and the diffuser) "turns in much earlier and has two stabs at the throttle". 12:22 Grosjean is yet to set a laptime, and clearly has another problem as he stomps out of the garage. 12:23 Massa's had a big moment on the power at the penultimate corner, but he catches the rear end thanks to a quick upshift to settle the rear wheels down. 12:23 Hamilton is now 0.535s clear of Rosberg. He's three quarters of a second clear of Vettel. Everyone else is over a second in arrears. 12:24 Rosberg popped in a personal best sector two time on his ninth lap on these tyres. Shows he has something in hand, raw pace-wise. 12:25 A bit of F1 engine insight from @RenaultSportF1: "Since this race is not power sensitive, Power Units may be a ‘mix and match’ of parts, with components of different ages or life cycles used"
12:25 Rosberg lowers his best time to 1m26.547s. That's 0.386s slower than Hamilton. The Mercs are clearly getting good life out of the tyres after those very slow start-up laps. 12:26 Both Mercs have pitted now. Magnussen goes P9 after his earlier trip through the gravel. 12:26 Raikkonen goes P10; he's over 2s off Hamilton's pace. 12:27 BEN ANDERSON has found ex-F1 racer and now experienced commentator Martin Brundle at trackside. Brundle reckons most drivers are struggling with the medium tyre, having complained about their cars a lot in the first session. 12:27 Magnussen pops up the order to seventh on 1m27.566s. 12:28 We get a replay of Hamilton having a big sideways moment on the entry to the chicane, which he decided to cut across once he'd gathered the car up. That's an every day (or should we say every corner) occurrence for Alonso, who is still fighting his Ferrari all over this track. 12:29 Towards the back of the grid, Bianchi is winning the Marussia v Caterham war, just 0.002s faster than Kobayashi. Ericsson and Chilton are currently miles away from them. 12:30 Magnussen goes faster again: up to fourth with a 1m27.100s. 12:30 Hulkenberg is the first car to take the soft tyres. 12:31 With this being a track where power is less significant, BEN ANDERSON is impressed with the look of the Red Bull. "The Red Bull seems to have the best downforce/grip/differential combination to get on the throttle super early exiting the hairpin. "The rest have to hesitate or perform some right-foot acrobatics to make it stick." 12:31 Hulkenberg's time is 1m26.870s, which puts him third. 12:32 If they're running similar fuel levels - which is a big IF - then we should expect a great Red Bull v McLaren v Ferrari battle this weekend. Vettel, Magnussen and Alonso are very closely matched at the moment. 12:33 Bianchi has improved his time and is now over a tenth clear of Kobayashi in 18th. 12:33 Kvyat clips a kerb in the chicane and pays for it as his Toro Rosso jumps out of shape when he gets on the power. 12:34 Kobayashi is also in trouble at the chicane. He has a huge slide on the way in as the rear steps out under braking yet again on the Caterham. 12:34 Hulkenberg improves to a 1m26.789s after a cool-off lap. He's still third. 12:35 More dramas for Kobayashi - he spins at Turn 8. Yet again the car got away from him on corner entry. 12:36 Vettel rejoins the fray for another run, while Ricciardo looks poised to improve on his current ninth. 12:36 Chilton jumps ahead of Ericsson into 20th. 12:37 Ricciardo - on softs - goes P1, on a 1m25.983s. 12:37 Vettel, also on the softs, is flying too. 12:38 Vettel goes P1, a 1m25.111s. A substantial chunk faster than Ricciardo. 12:38 Grosjean told on the radio: "Box Romain, box, we've still got the leak, sorry." 12:39 A Caterham heads off track again. This time it's Ericsson, running through the asphalt run-off at the quick Turn 11 right-hander. 12:39 Bottas goes third fastest on the soft tyres on a 1m26.053s. 12:40 Lotus adds on Twitter that Grosjean's problem is a cooling system leak. 12:40 Sutil goes seventh on 1m26.919s. Kvyat also opens a lap on the soft tyre. 12:41 "I don't know, I had no power down the straights," Vettel complains, before discussing various settings he is experimenting with on the Red Bull. 12:41 Message to Hamilton: "In terms of braking you were on the limit with that prime tyre." 12:42 Vettel found 2.109s over his best medium tyre lap from this morning. 12:42 Rosberg is now on a flying lap on the softs, so can he break into the 1m24s? Or even the 23s? 12:43 Rosberg's lap is a 1m24.720s. Not a great final sector. 12:43 Perez goes 10th on a 1m27.013s. 12:44 Raikkonen has moved up to fifth on 1m26.116s. 12:45 BEN ANDERSON: "Kvyat is so committed through Turns 10-11. He picks up the throttle really well through the right (11). Massa is also good through here, but the Mercedes drivers look a bit wild. "Rosberg is getting cleaner, but not totally smooth. Perez carries too much speed into T11 so he's late on the power. Bottas is silky smooth, and so is Raikkonen." 12:45 Vergne goes P9 on 1m26.907 but is topped by Kvyat on 1m26.689s. 12:45 Massa has a spin at the chicane. He lost the rear as he touched the brakes, and replays show that he didn't touch the grass. 12:46 Hamilton goes fastest on 1m24.513s. 12:46 Hamilton is a couple of tenths up on Rosberg's time. Vettel is four tenths off the slower of the Mercs. 12:48 Button improves from 17th to seventh on 1m26.234s. 12:48 Hamilton sets a new fastest first sector time. 12:49 Magnussen improves from 15th to fourth on 1m25.735s. He looks really on it this weekend, that off at the chicane notwithstanding. 12:49 Hamilton improves to 1m24.482s. 12:50 Hamilton was a tenth off his best in sector two on that lap, so has a theoretically faster time in him. Meantime, Rosberg pits. 12:50 BEN ANDERSON says that Kvyat is "oozing confidence" - not bad for a rookie. He also reckons that Raikkonen looks good today, but the Ferrari is making him wait to get on the throttle compared to some of the other frontrunners. 12:51 Raikkonen improves to P4 with a 1m25.730s, just 0.005s faster than Magnussen. 12:52 Magnussen strikes back! A 1m25.580s puts Raikkonen back in his place. 12:53 Alonso leaps up from 16th to fourth on 1m25.437s. 12:53 Magnussen speculates that something is up with his engine braking. 12:54 Another replay on the TV screens - another Caterham running off track. That looked like it was at Turn 11. 12:56 Grosjean's previously leaky Lotus is back in action. 12:57 Grosjean records his first lap of the session: 17th place on 1m27.021s. 12:58 Not much joy for Grosjean out there, he understeers through the first part of the chicane and then clatters over the kerb in the second part. Painful. 12:58 Both Mercs are back on track. Long runs ahoy with 30 minutes of the session remaining. 12:58 Radio to Bottas: "Change of plan Valtteri, long run on this tyre, the other car had a problem with their options, so we'll long run on this tyre...until it dies." 12:59 And now Hamilton is back out again. Practice start, no doubt. 13:00 Grosjean pits having got to within 0.002s of Maldonado. 13:00 Rob Smedley is grappling with the left-rear wheel on Massa's car, obviously trying to work out what the problem is on the Williams. 13:00 At the back, Kobayashi outpaced Bianchi on the soft-tyre runs, but only by a tenth of a second. 13:02 Rosberg is in the 1m28s on high fuel, which is pretty impressive. 13:03 With the race runs dominating proceedings at the moment, fuel management is on the agenda for Hulkenberg, who is told: "You only need about half of that lift and coast, we're doing a little bit too much at the moment." 13:04 On that lap, Hamilton and Rosberg were running equal pace in sector one, but Rosberg was two tenths up in sector two, with Hamilton taking a tenth back in sector three. 13:04 The right-pillar of the front wing (and the floor of the car behind it) on Rosberg's car is covered in aero paint. 13:05 On this one, again they set equal S1 times, Rosberg takes a tenth in S2 and Hamilton likewise in S3. Rosberg was quicker by 0.02s! 13:06 Message to Hamilton: "You were one gear lower, Turn 9 and 10". 13:07 Again the Mercs are within a tenth of each other on this metronomic race-run simulation. It just underlines how crucial qualifying is going to be this weekend. 13:08 Rosberg is told on the radio: "Nico, we need a lower gear in Turn 1 - engine damage". 13:09 Rosberg lost three tenths in sector one after that radio message. 13:09 He is now very slow in the middle sector. 13:10 @WilliamsRacing: "Felipe felt something on the rears but car looks ok after Rob Smedley had a good feel around! So he switched tyres to mediums"
13:10 Vettel bangs in a 1m28s lap in the middle of his race run, that's promising. 13:10 Rosberg is back up to pace in sector one. 13:11 "Did you ask me to take fourth gear for Turn 1?" Rosberg enquires. "Yes, we wanted a longer gear but it's too much for the engine," he is told in response. 13:16 Hamilton even managed a 1.28.4s during this run, the soft tyre is really holding up well for a long first stint on Sunday. 13:16 "This option [tyre] looks fairly robust, not much deg, we'll continue on this tyre and see where it goes," is the message to Hamilton on the radio. 13:16 Ricciardo pits and rejoins. 13:17 Magnussen's race run hasn't looked anything like as good as the Mercs or Vettel's Red Bull, but he has had traffic. 13:18 Magnussen backs off to make some space behind Perez, and then cuts off Sutil as the Sauber closes up behind him. 13:18 "Tyres are finished," says Rosberg, who is currently on softs, and pits at the end of that lap. 13:18 Rosberg did a 1m28.2s on lap 10 of this stint. That is also hugely impressive. 13:19 Rosberg rejoins after that pitstop, and takes the mediums. 13:20 There's 10 minutes of the session remaining. 13:20 Vettel's race run times aren't in the same ballpark as the Mercs. 13:21 Red Bull tells Vettel: "Hamilton was one lap less than you on that stint." 13:21 Hamilton pits for mediums. 13:24 A short on-board replay with Button shows him having to fight the McLaren (and its soft tyres) in the long final corner. 13:25 "Is there something wrong with my front brakes?" asks Hamilton, who is given instructions to reset some settings on the car. 13:26 Kvyat clips the dirt on the outside as he approaches Turn 12, and his Toro Rosso gets well out of shape. 13:28 Rosberg on the radio: "Some advice please?" "So, think about Turn 2 exit to get a better Turn 3"
13:29 A couple of drivers have bailed out of this session a little early. Both Ferraris have pitted. 13:30 Kvyat will end the session with the most laps completed. He's up to 41 already. 13:30 Least laps will be Grosjean, after his cooling system leaks. He's on his 15th lap now. Chilton had a much better session, getting through 35 laps. 13:31 Grosjean didn't even complete that one, as he pits. 13:38 Here's EDD STRAW's comprehensive report from FP2, with Hamilton beating Rosberg to top spot. Full times and lap counts included. 13:40 We'll bring you the early reaction from today's running as our team of reporters have headed into the paddock to speak to the drivers, so stick with us here on AUTOSPORT Live to hear what they have to say. 13:56 In the meantime, GP2 qualifying has just begun. First car on track is Johnny Cecotto Jr, who has been given a three-place grid penalty for his "reckless collision" with Jolyon Palmer this morning. Now Tom Dillmann has crashed into Sergio Canamasas in the pitlane! Idiotic scenes. 14:08 The Red Bull drivers' reactions to today's F1 running suggest they're not particularly pleased with how their weekend is shaping up relative to Mercedes. 14:09 After the first GP2 qualifying runs there's a shock at the top of the times: Pic and Sato lead a Campos Racing 1-2. Points leader Palmer is third, and he hasn't been off the front row all season. Vandoorne is fourth, ahead of Marciello in a McLaren v Ferrari protege duel. Richelmi is sixth but his car broke down on the start/finish straight. 14:19 With seven minutes of GP2 qualifying remaining, Dillmann has taken provisional pole for Caterham, despite that bizarre start to his session. He was on pole here last year for Russian Time. 14:28 Nasr takes his first-ever GP2 pole, banging in two fast laps towards the end of the session that were good enough for the top spot. Palmer, who hasn't been off the front row all season, was only seventh fastest. "I think other people potentially gain a little bit more Friday to Saturday than we do," he said. "We hope we can do a big enough step to keep the pace of today." 14:35 When asked if the removal of FRIC suspension systems from the cars has made a bigger difference here than at Hockenheim, Rosberg says "maybe". He adds that his long run was "OK - there's degradation at the rear, [and] the tyres are generally quite hard". "It was positive so we're definitely going to keep it on the car. We're already having both cars with the new rear wing and it was giving what it's supposed to give." 15:07 That's it for our coverage from Hungary for today. Keep an eye on autosport.com for the rest of the reaction from today's running, including our in-depth analysis from GARY ANDERSON and EDD STRAW. 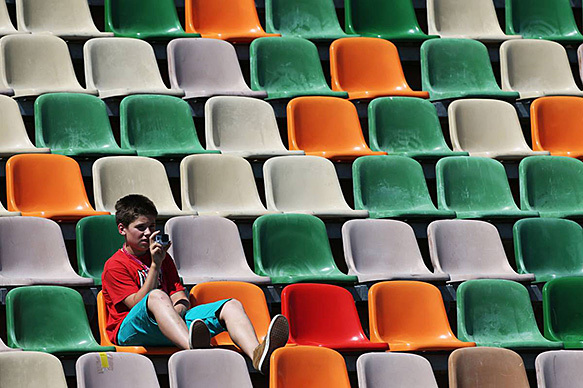 We'll be back tomorrow morning for coverage of final practice and qualifying for the Hungarian GP. See you then!